What is the easiest way to make sure that your pet lives as long as possible, while making sure they are not painful or experiencing discomfort? A yearly physical exam (for cats younger than 9 years old and for dogs younger than 5-8 years old [depending on size and breed]) and a bi-yearly exam for our middle aged friends! 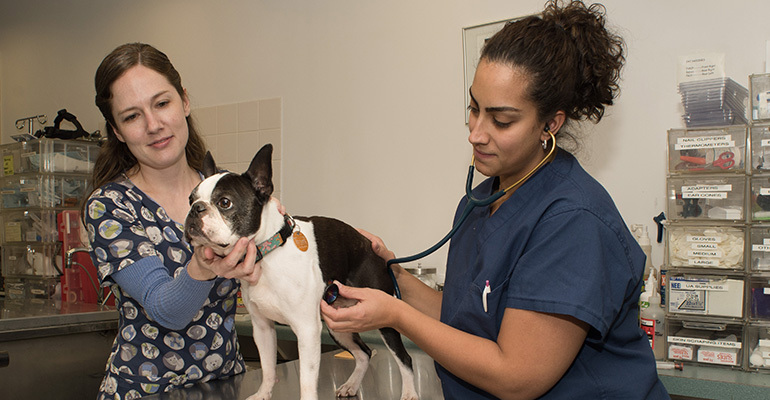 A physical exam involves taking a thorough history including information about your pet’s diet, environment, lifestyle and mental health. Following the history, your pet will be examined from nose to tail. 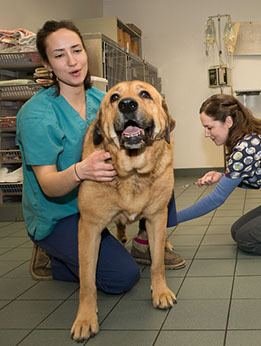 Our veterinarian will then discuss the results of the exam and what they mean in terms of your pet’s health. We may recommend blood work to determine more about your pet’s well being or further testing if there are reasons for concern. At Katz & Dogs Animal Hospital, clients frequently comment that they wish their own doctors were as thorough with them as we are with their pets! To us, every pet is an individual. Once we have discussed your pets risk factors for certain diseases and determined their overall health we can make a decision together about which, if any, vaccines are needed. Vaccines work by stimulating a pet’s immune system to make antibodies to a disease. A small amount of a weakened or inactivated infectious agent is injected and a pet’s immune system does the rest of the work. It is therefore imperative that your pet be healthy before receiving a vaccine. We divide vaccinations into two groups. The core vaccines are vaccines for diseases that all pets are susceptible to. The non-core vaccinations are vaccinations for diseases that your pet may be exposed to depending on his or her lifestyle. Core vaccinations for dogs include Rabies and a Distemper combination vaccine (which includes distemper, two forms of canine hepatitis, parainfluenza and parvo viruses). At Katz & Dogs Animal Hospital we are cautious not to “over-vaccinate.” As such, we may recommend using a Titer to determine your pet’s immunity level from previous vaccines. Evaluating a Titer involves taking a blood sample and looking for antibodies to the disease(s) we are vaccinating for. Whenever possible, we recommend titering dogs for the diseases that compose the core Distemper combination. The state of New Jersey does mandate that a Rabies vaccine be current on all pets, unless a medical condition precludes it. There is a vaccine for Lyme disease available. We recommend it if your dog has a high level of exposure to areas with a lot of shrubs and foliage or to areas where deer and mice can be found. It is important to keep in mind that there are many diseases other then Lyme disease that are carried by ticks. Many insects that transmit these types of diseases may be too small to see. We therefore always recommend tick control for dogs, even when the Lyme vaccine is not given. Many tick preventatives also protect against fleas. Another non-core vaccine for dogs is the Bordetella Bronchoseptica. This vaccine protects against a disease commonly known as “Kennel Cough.” It is most often seen in dogs that have a high level of association with other dogs. Risk factors include going to groomers, boarding and daycare facilities, obedience class, pet stores and any areas where dogs are in contact with each other. Many kennels and daycare facilities in our area require a Canine Influenza vaccination. We only recommend giving this vaccine if required by the facility of your choice. At Katz & Dogs Animal Hospital we are cautious not to “over-vaccinate.” As such, we may recommend using a Titer to determine your pet’s immunity level from previous vaccines. Evaluating a Titer involves taking a blood sample and looking for antibodies to the disease(s) we are vaccinating for. Whenever possible, we recommend titering cats for the diseases that compose the core Distemper combination. The Feline Leukemia vaccine is only recommended if you have a cat that goes outdoors. We recommend checking all pets stool yearly for many types of intestinal parasites including giardia. Undetected intestinal parasites can pose a risk to your human and animal family members. We also recommend flea and tick preventatives for all patients who go outdoors. We will be happy to discuss the safety of these products with you during your visit. All dogs should be given a monthly heartworm preventative. These medications protect not only against heartworm, which is a blood parasite carried by mosquitos, but also against some intestinal parasites. We test dogs for heartworm disease by taking a blood sample from them starting at one year of age. We then test yearly or every other year in accordance with the recommendations of the American Heartworm Society. The variable factors depend on where your dog has travelled and how regularly they receive prevention. Cats that go outdoors should be tested for annually the Feline Immunodeficiency Virus (FIV) and the Feline Leukemia Virus (FeLV). While you and your pets are with us we can show you how to brush their teeth, clean their ears, trim their nails and more!